Former Bangladesh Bank governor Aitur Rahman speaks at the closing ceremony of an international symposium titled ‘Achieving Agenda 2030 of Sustainable Development’ on BTATC campus in Savar on Tuesday. 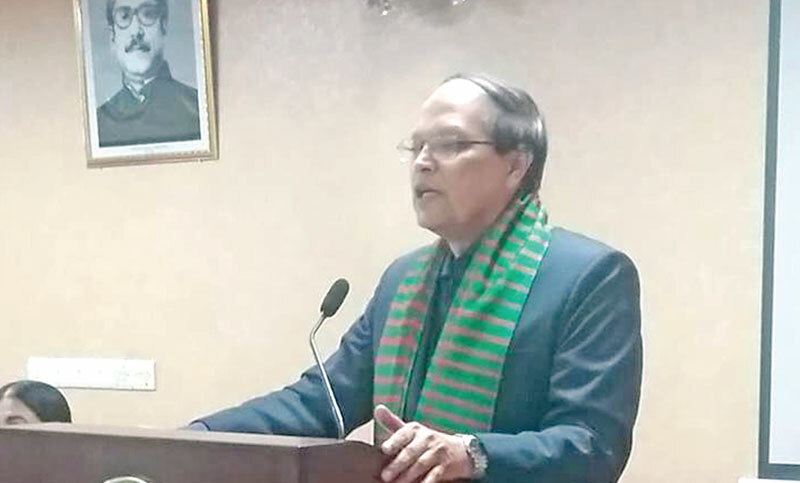 Bangladesh Bank former Governor Atiur Rahman has put emphasis on public-private partnership (PPP) initiative for implementation of sustainable development goals (SDGs). The eminent economist also focused on entrepreneurial resource development while addressing an international symposium at Bangladesh Public Administration Training Centre recently. Aitur Rahman was the chief guest at the closing ceremony of International Symposium on “Achieving Agenda 2030 of Sustainable Development” at BTATC campus in Savar, an outskirt of the capital, said an Unnayan Onneshan handout on Tuesday. Prof Atiur said: “The state and non-state actors must be active in entrepreneurial development and should play bold roles in implementation of SDGs,”. He also mentioned that the technology is not enough without human factors, especially towards the SDG journey. Public officials and researchers including 15 foreign participants attended the conference to share knowledge on research and development. The conference focused on SDGs Implementation mechanisms, challenges faced capacity building needs and desired training curriculum for developing critical competence of civil servants of the participating countries. Prof Atiur asked the civil servants to look at the society as the mirror and must ask them if they like what they see in that mirror. He also welcomed the foreign participants and provided an overview of how Bangladesh made a spectacular journey of inclusive development from ashes to prosperity. “Positive policy environment has, of course, been created by the government for such a complementary role of other actors. However, the challenges of change management still remain and the significance of integration and navigation between the actors demand development of capacity building of the public servants,” Prof Atiur added. Prof Atiur reminded the participants that a digital culture which empowers people and attracts better talents was already on and it was up to the leadership involved in improving public services to take it forward for achieving transformational goals.